Morrigan Crow is cursed. Born on an unlucky day, she is blamed for all local misfortunes, from hailstorms to heart attacks - and, worst of all, the curse means that Morrigan is doomed to die at midnight on Eventide. But as Morrigan awaits her fate, a strange and remarkable man named Jupiter North appears. Chased by black-smoke hounds and shadowy hunters on horseback, he whisks her away into the safety of a secret, magical city called Nevermoor. It’s there that Morrigan discovers Jupiter has chosen her to contend for a place in the city’s most prestigious organisation: the Wundrous Society. In order to join, she must compete in four difficult and dangerous trials against hundreds of other children, each boasting an extraordinary talent that sets them apart. Except for Morrigan, who doesn’t seem to have any special talent at all. To stay in the safety of Nevermoor for good, Morrigan will need to find a way to pass the tests - or she’ll have to leave the city to confront her deadly fate. 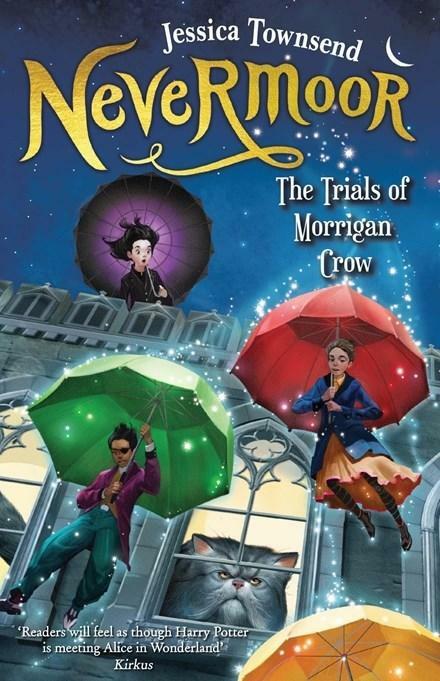 Nevermoor: The Trials of Morrigan Crow is the first book in a charmingly odd, breathtakingly adventurous and entirely magical new children’s series. Debut author Jessica Townsend created a major stir at Frankfurt Book Fair last year and the industry hasn’t stopped buzzing about her book since. I am certain it won’t disappoint expectations, not least those of the children destined to meet Morrigan Crow. Morrigan is exactly the kind of heroine I love best. She’s determined, inquisitive and has a knack for finding the humour in the worst of times. This last trait is extremely helpful, as she also happens to be a Cursed Child, making her responsible for all kinds of local misfortunes (her politician father resentfully foots the compensation bills while Morrigan writes endless apology letters). Oh, and it also means that she’s fated to die at midnight on Eventide. Luckily for us readers, she forgoes this decidedly morbid event and is instead whisked away by an eccentric stranger, narrowly escaping a pack of terrifying, ravenous shadow hounds. Our eccentric stranger is the esteemed Jupiter North of the Wundrous Society. He offers Morrigan a home at the extraordinary Hotel Deucalion, which lies within the city of Nevermoor, and the opportunity to join the secret society from which he hails. To do this, Morrigan must pass a number of mysterious trials and avoid falling into the hands of the odious Inspector Flintlock, who’s determined to exile her for not being a legal citizen. Discerning young readers will no doubt pick up on the connections this novel draws with our own world here. The magic of Nevermoor is shiveringly, thrillingly wonderful. Open its pages and discover a hotel room that changes to suit your personality, a large talking cat with exactly the right amount of cattitude, and children with awe-inspiring magical abilities. This novel is an absolute treat. For ages 9+.